Five Earth oceans with different names. None alike and none the same. Some are warm and some cold. Can you find one on a globe? Now take your finger and go around. Follow the ocean between the ground. Keep on going just for fun. Are there many oceans or just one? Stretching far from shore to shore. In bays and gulfs and seas and more. To tell you would take too much time. If you decided to take a trip. On a boat or sailing ship. Which oceans would you choose. To be a part of your ocean cruise? Some are cold and some are warm. Some are calm and some have storms. Ocean water blue and green. How many oceans have you seen? Out in the sea and even on dry ground. Water cycle and ocean air. Does your rain water come from there? Near the shore things move about. As tides come in and tides go out. Pulled by a force that you can't see. Up and down ocean waves go. Close to the beach they seem to grow. Like roller coasters they behave. Do you know what causes ocean waves? Ocean water moves in currents, too. Peru, Alaska and Gulf Stream are a few. Some flow down deep and some near the surface. Like water conveyor belts, do they have a purpose? North and South and top to bottom. Big changes out in the Pacific sea. An El Nino? Now what could that be? Earth's oceans are really grand. But ocean water's not like that on land. Not fresh, it's salty, for fish, just fine. Could you pickle sea cucumbers in ocean brine? Ocean water, there's so much of it. And ocean critters, they just love it. So much water that you can't drink. Are ocean fish thirsty, do you think? So many things live in the sea. And sure, the ocean's a fun place to be. But why should you make such a bother. To learn about Earth's ocean water? An Ocean of a Problem? Some say there is a change out there. That could change Earth's ocean air. And could we stop it if we were smarter? How is ocean water like water in your neighborhood? How is it different? How does ocean water move? Why is ocean water important to ocean living things? How is ocean water connected to ocean air and land? Why is ocean water important to living things on dry land? How could changes in ocean air change ocean water? Water Cycle - Interactive Water Cycle for Kids from the USGS. Select Beginner, Intermediate or Advanced viewing level. The following resources provide information and materials to help you learn about ocean water. Discover Water - For kids. Everything you want to learn about Earth's water. Select Discover our Ocean then play the games, explore, and create a printable poster to share what you learn. NOAA Ocean Facts Have questions about Earth's oceans? NOAA has the answers and more. Exploring the Oceans This Extreme Science site has ocean information and more. USe the following site to learn about Earths' ocean water. NOAA Learning Objects provide in-depth information in an engaging format about Earth's oceans. Access the lessons on: The Water Cycle, Ocean Currents, Ocean Waves, Tides, Energy from the Ocean and Ocean Pollution for a comprehensive study of Earth's ocean water. NOAA El Nino Theme Page for information about this ocean phenomena. Tsunami Interactive Learn all about tsunamis. This site takes awhile to load. The following resources have lesson plans, investigations and other information to help your create that perfect investigation for your students. NOAA Acitivty Book celebrating 200 years of NOAA research in pdf format. NOAA Ocean Service Education site with link to a variety of activity books and resources. Access full Lessons Plans from the Teachers menu. NOAA Ocean Service Education Ocean Basics with links for teachers and students about Earth's ocean water. NOAA Photo Library All free to anyone. Dive Gallery All images and videos on this site are free to teachers and students. Disney's Oceans Complete with an 8 page activity and 42 page teachers' guide for your classroom. This issue of Beyond Polar Bears and Penguins online magazine explores Polar Oceans. Includes misconceptions, activities, recommended books and more. Additional archived issues are available here. This American Library Association site has links to all kinds of great websites for kids. Here are a couple interactive sites that allow students to explore ocean topics. The beach is where ocean water and the shore meet. It's a place where you can swim in ocean water and walk on ocean land. It's a place where you can see the ocean water move in waves. It's a place where you can watch the tides rise and fall. It's a place where you can touch, see or hear ocean living things. It's a place where you can watch, hear and smell the ocean air. Want to put a bit of the ocean in a jar? Then this investigation is for you. This investigation is recommended for K-1. How much of the Earth's surface is covered by ocean water? Do this investigation and see if you can figure it out. In this investigation you will make an estimate of the amount of Earth's water in its oceans. Then you will make a model to see how close you came to the right answer. Every two to seven years, the trade winds in the ocean air over the Pacific Ocean change. This change in the ocean air causes the ocean water surface temperatures to change. 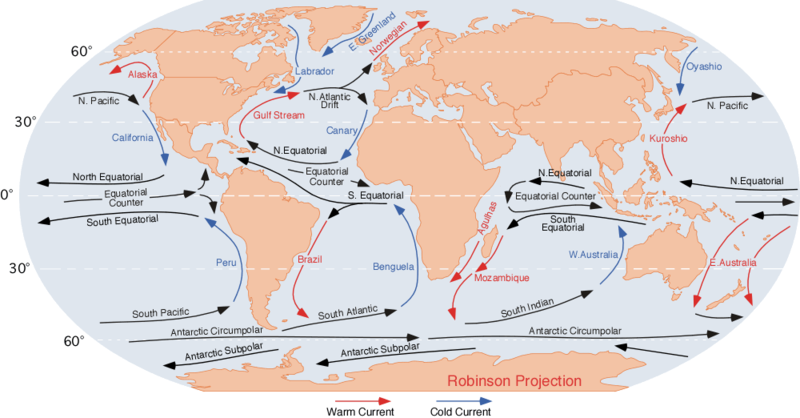 These changes lead to changes in ocean currents, weather patterns and more. It's an El Nino. Want to make your own El Nino? Then this investigation is for you! Or make some El Nino pudding and eat it while learning about ElNino. Ocean water moves. It moves in waves. It moves in currents. And it moves in tides. What causes waves? What causes currents? And what causes tides? These investigations can be adapted for beginners or lower grade levels. One approach is conduct the invesitgations as a demonstrations and explore concepts through class discussion. Besides tasting salty and not being water that you can drink, what else is different about ocean water? In this investigation you will explore some of the differences between salt water and fresh water.